On the evening of Tuesday, May 29, Maple Ridge City Council lined up with the mob of anti-homeless Ridgeilantes and voted down BC Housing’s rezoning application for a permanent supportive housing and shelter building on Burnett Street. Unlike the temporary modular building that BC Housing plans to open on Royal Avenue this fall, the Burnett Street project requires a rezoning permit that the Municipal government has the authority to deny. The project proposed for Burnett Street was created and funded under the BC Liberal government but has not been built because at each site where it has been proposed since 2016, anti-homeless bigots have mobilized against it. Successive governments at the Provincial and Municipal levels have been glad to use the excuse to not build resources for the poor, or as in the case of Mayor Nicole Read’s City Council, have not had the courage to stand up against anti-homeless hate. Despite having initially applauded the Province’s purchase of the site and saying that housing couldn’t happen “fast enough,” Mayor Read used a shabby justification for voting the rezoning down. She argued that the institutional-style “supportive” housing being proposed isn’t “supportive” enough, and should be staffed by “clinical care professionals” beneath the Fraser Health Authority umbrella. Anita Place tent city residents are against the Mayor’s logic that conflates medical care with housing. Dwayne Martin asked, if they want to treat poor people as patients then “why’d they close down Riverview?” Anita Place was already on the record as opposing the invasive 24-hour staff of the BC Government’s “supportive” housing model and called for social housing to be organized as regular apartments with rents at levels that people on welfare and pension can afford. Anita Place residents do want the outreach support, trauma care, and mental health care that Maple Ridge Council wants to be forced on tenants, but we want it to be available to everyone in society, based on their individual needs. People need self-determination over their mental and physical health care and supports, not re-institutionalization that forces “care” on low-income people as a precondition for getting a home. Mama Bear explained, “Most of the people here don’t need doctors… a lot of the people are here just because they don’t have a place. Not because of drugs, but because their rents got raised and they had to move out.” The assumption that all homeless people require clinical care integrated into their housing distracts from the reality that homelessness is caused by economic policies. When Esme Manor faced renovictions so that the landlord could double rents, four out of eight tenants evicted ended up staying in Anita Place. Xylah echoed the sentiment that City Council is gesturing at drug use, mental health, and disability in order to confuse the fundamental issue of providing dignified housing: “They’re blurring the issue… we are not in need of hospitalization, we just need homes.” She pointed out the double standard that the government applies to people on the basis of their economic security: no one assumes that people living in apartment buildings are in constant need of intervention by social workers and medical professionals but the moment they are evicted to the street, they become objects to control. Anita Place residents are uninterested in institutional housing that resembles hospitals or prisons. Joe said, “if it looks like a hospital, smells like a hospital, it is a hospital.” In response to the rhetoric City Council used on Tuesday night to justify blocking housing, Sandy said, “I’m beyond anger.” Sandy knows about the policies and practices used in supportive housing buildings because she has been a caretaker of a terminally ill friend who still lives in Alouette Heights supportive housing in Maple Ridge. She said that the staff “police the building… Everything they do is illegal” because they constantly violate the Charter and human rights of tenants. Many of the people who protested against the Brunett Street site also participated in the protest camp on Royal Crescent, where BC Housing plans to build supportive modular housing. Dwayne commented on the irony that anti-homeless protesters were able to influence City Council after less than a week of posturing in tents, whereas Anita Place has been running for a year to lobby for homeless people’s survival needs. Anita Place is angered but not surprised that yet again, Maple Ridge City Hall has served as a site where anti-poor bigotry is normalized and homeless people are sentenced to social and economic exclusion. 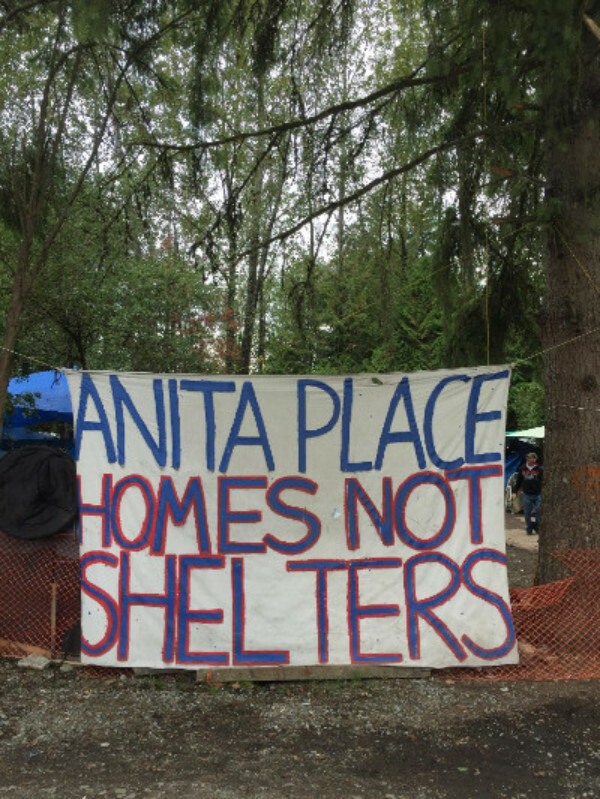 Anita Place Tent City is a model for a self-governed low-income community that has successfully fought government attempts to break up the camp, and has continued to assert its autonomy and self-determination against efforts by BC Housing to take control over the camp. In September 2017, Anita Place released a plan for a self-determined social housing building, shelter, and health care centre that, so-far, the state has refused to acknowledge. Both the City and Province are ignoring direction from those most affected and following prescriptions for housing from anti-homeless bigots.